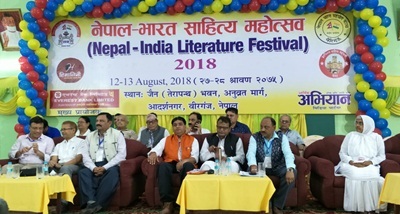 Nepal-India Literature Festival 2018 has begun in Birgunj, Nepal. Inaugurating the festival Chief Minister of Province 2 Mohammad Lalbabu Raut said that it will play an important role in further strengthening Indo-Nepal ties. He said, both countries have age old religious, cultural and social relations and literary exchange will further boost it. On this occasion eminent writers from both the countries were also felicitated. Around 250 participants from India and Nepal are attending the two day festival. The event has been organised by Nepal India Co-operation Forum.